On Sunday, Pete Buttigieg formally announced his candidacy in South Bend, Indiana, where he has served as mayor for eight years. Just a few months ago, few people had heard of Buttigieg and fewer still could pronounce it. (His campaign encourages people to pronounce it “Boot Edge Edge”.) But he caught many people’s attention at a CNN Town Hall in March, standing out in the crowded field of Democratic hopefuls as the youngest candidate at 37, who also happens to be openly gay, a vet who fought in Afghanistan, and a progressive who has won support in a conservative Rust Belt state. He’s since seen surge of interest over the past six weeks. A poll on Friday placed him third among voters in Iowa and New Hampshire, after Bernie Sanders and Joe Biden. 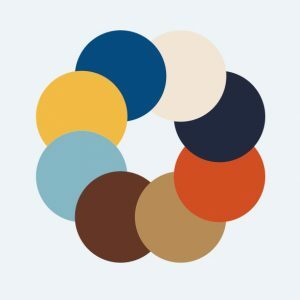 In an interactive mood board on the design toolkit website, you can see exactly how these colors came about: You can slide across various photographs from Buttigieg’s world, seeing how they are made up of the nine campaign colors. Some of the images are of Buttigieg at home with his husband, Chasten Buttigieg, while others are of scenes around South Bend, from the factories that have closed to the new tech center that Buttigieg helped build. There are pictures of Buttigieg’s favorite whiskey, Talisker, his shoes, and the watch that Chasten gave him as an engagement present. Starting today, those who support Buttigieg now have access to all the campaign’s assets. 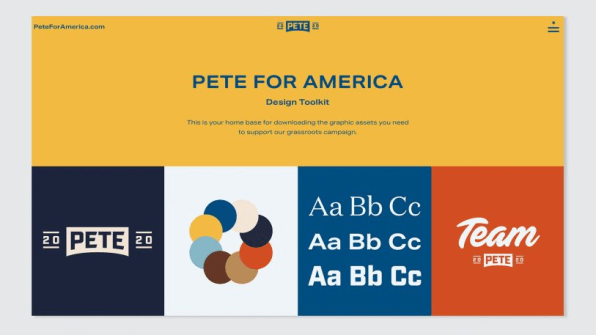 On the design toolkit website, Hyperakt has laid out the main logos, including “Pete 2020,” “Team Pete,” and a funny graphic that simply says “Boot Edge Edge.” Supporters can play around with these logos by reconfiguring them in different colors, then downloading them in whatever size they like, including an Instagram icon, a desktop wallpaper, and a printable sign. Hyperakt also created specific Pete 2020 signs for each state, which supporters can download and use. These are very clearly inspired by sports imagery, and look a little like vintage pennants for sports teams. People are free to use and distribute the images within the toolkit, but they are not allowed to sell anything with assets to make money for themselves. This is similar to a creative commons non-commercial license. This is the first time a campaign has made a design toolkit so easily available to supporters. In the past, supporters have been able to buy official merchandise and posters from the candidate’s website, and third parties try to capitalize on the popularity of a candidate by selling merchandise with their own graphics. (There are many Pete Buttigieg T-shirts currently available on Amazon that are not affiliated with the campaign.) What’s more, supporters often come up with their own images, then disseminate them. One of the most well-known examples of this was the Hope poster that the artist Shepherd Fairey created featuring a stylized image of Barack Obama’s face. But most supporters don’t have the design skills or resources to create elaborate images or logos, so they use simple online tools to create their own signs or social media icons. And without a single visual language, supporters use a mishmash of colors, fonts, and graphics. When Buttigieg launched his exploratory committee at the start of 2019, he seemed like a long-shot candidate and was widely seen as an underdog in the race. Now he’s a serious contender for the Democratic ticket, and he will need to scale up his organization quickly. A big part of this will be organizing grassroots support. Peraza hopes that the toolkit will help propel the campaign forward, giving the movement a recognizable look, one that supporters will be excited and proud to rally around. “We’re scrappy, but this is a high-performance organization, and there are high standards, and we’re paying attention to every detail,” Peraza says.